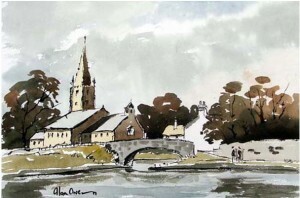 Our very good friend Alan Owen has offered some insight into his art and painting style. 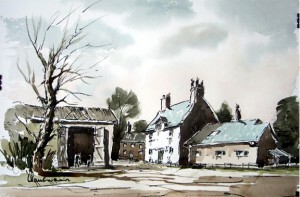 He has been a supporter of Westhoughton Art Group since its inception and continues to inspire today. He paints in a loose watercolour style and is a fan of Edward “Ted” Wesson whose style I find very challenging and would love to be able to execute with the almost (seemingly) effortless ease that Alan does. As you become more acquainted with watercolour painting you start to realise that painting a scene in an almost exact copy of a photo is not the really hard thing…… it’s the “Art” of letting yourself create an impression of a scene that’s challenging. Trusting that the viewers brain does not need every details spelled out for it…..that the suggestion of a tree or hills in the distance; is all that is really needed. It takes some courage to use the strength of darks that are needed in a good watercolour and I know that it may frighten you off….. but “go for it”…. it’s just a piece of paper and a bit of paint worth pennies….. you have nothing to lose and lots to gain. If you feel a bit nervous about it and want to experiment then scan your painting before you add the darks….then you can try them out on the print to give you confidence. Note the very limited palette that Alan usually uses. Using too many colours in a landscape can often “jar” on the eyes whereas using a limited palette will more easily create a harmonious end product. I’ve had the great pleasure to watch Alan painting and he does these paintings in a very relaxed manner. He doesn’t worry too much if there are runs or anything untoward….. he just goes back over and fixes it. He may well create a painting like the ones above in 10 to 20 minutes….. so don’t stress over getting everything “just so”…… it’s an impression of a scene. …….And don’t fiddle with it.